Ce document au format PDF 1.7 a été généré par Elsevier / Acrobat Distiller 9.0.0 (Windows), et a été envoyé sur fichier-pdf.fr le 07/07/2017 à 14:55, depuis l'adresse IP 194.214.x.x. La présente page de téléchargement du fichier a été vue 275 fois. Taille du document: 566 Ko (10 pages). boulevard Tonnellé, 37044 Tours cedex 9, France. dietary intake); and determined how to interpret the results from this scale to guide clinical practice. structure using a factor analysis for ordinal data and internal consistency for each DEBQ dimension. 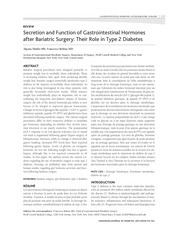 Results &gt; Our results supported a three-factor structure for both normal weight and obese patients. P. Brunault, I. Rabemampianina, G. Apfeldorfer, N. Ballon, C. Couet, C. Réveillère, et al. higher emotional eating (r = 0.302; P = 0.10). consistance interne de chaque dimension du DEBQ. Résultats &gt; Le DEBQ possède une structure tridimensionnelle comparable dans les deux populations. p = 0,10) et la restriction cognitive (r = 0,294 ; p = 0,10) avaient tendance à augmenter. traitant de manière précoce les troubles psychiatriques). risk for the development of eating disorders. determined the factors associated with each DEBQ dimension. 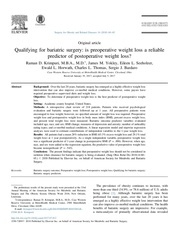 prepared for bariatric surgery and postoperative follow-up. patients  would also be found in normal weight patients. follow-up of the obese patients. the conduct of the study. We entered and analyzed all information anonymously. Van Strien et al. Ratings are made on a 5-point Likert scale . developed by Lluch et al. .
tenets of the Declaration of Helsinki. populations are in table I.
three-factor structure (ﬁgure 2 and table III) for obese patients. 22, 24, 26, 29, 31), except item 24 (0.24). comorbidity and health-related quality of life. while a too large increase in cognitive restraint may be associated with eating disorders . belongs to the corresponding factor. normal weight and obese persons; –: indicates a factor loading lower than 0.10. Loadings in bold indicate that the item belongs to the corresponding factor. BMI: body mass index; r: Spearman's correlation coefficient; ns: non-significant; significant associations are indicated in bold fonts. of life in these populations. at one medical meeting (2014). Petry N, Barry D, Pietrzak R, Wagner J.
Peeters A, Barendregt JJ, Willekens F, Mackenbach JP, Al Mamun A, Bonneux L, et al. false? Curr Opin Gastroenterol 2010;26:165–9. Gearhardt AN, Corbin WR, Brownell KD. validity in a nonclinical sample. 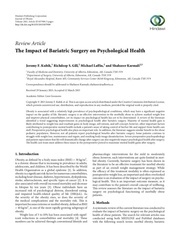 Can J Psychiatry 2014;59:276–84. doi:PMCID:PMC4079141. hypothesis for obesity: what went wrong? in obesity. History of ideas, clinical description. Leidy NK, Sexton CC, Lowe MR, et al. diverse sample of obese and non-obese participants. Int J Obes (Lond) 2009;33:611–20. environment for statistical computing; 2012. Fox J. Polycor: polychoric and polyserial correlations. Version 0.7-8; 2010, http://cran. Basdevant A. Médecine et chirurgie de l'obésité. Paris: Lavoisier; 2011. Ce fichier a été mis en ligne par un utilisateur du site. Identifiant unique du document: 00528491.